But the word around the internet this week is that they’re doing anything but helping girls grow more confident. 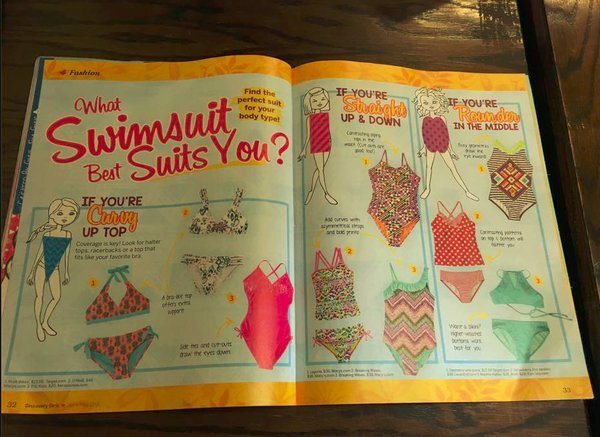 In an article in the magazine’s most recent issue — published for girls 8 and up — they broke down swimsuit styles, recommending certain ones based on body type – curvy on top, rounder in the middle — you get it. Catherine Connors, blogger at Her Bad Mother wrote a post called Girl Power: You’re Doing It Wrong, sharing her disappointment in the magazine’s direction. Catherine joins Kim and Jackie to discuss the article and the bigger underlying problem. What do you think? Did Discovery Girls magazine get it wrong? Do you have a story or want to share your voice and/or expertise on Broadscast? We want to hear from you!